It took Missouri's jack and mule industries several years to recover from the devastation of the Civil War. It was noted that it took until 1879 for the mule industry to reach the level that it had been in 1860. This was largely due to the slow recovery to the cotton industry in the south. Missouri breeders began to seek larger and higher quality jacks to use on both jennets and mares. For example, the largest jack ever sold in Tennessee at that time came to Missouri. This three year old jack was 16:2 hands high, 11 feet 7 inches long, and from tip to tip between his ears, 35 1/2 inches. In July, 1889, a Tennessee breeder made another importation of Catalonian jacks and jennets. They then offered 25 jacks and 10 jennets for sale. Charles F. Leonard, son of Nathaniel Leonard of Cooper County, purchased eight of the best jacks and brought them to Missouri. In November 1888, several jackstock breeders met in Chicago to form a breed registry. Charles F. Leonard was elected president. The new association was named the American Breeders' Association of Jacks and Jennets. The firm of Guyton and Harrington was located in Lathrop, Clinton County, Missouri. They first began selling horses to the British government during the Boer War (in South Africa) from 1898 - 1901. In all, this firm supplied 115,000 Missouri mules and 65,000 horses to the British government. Later they supplied pack mules to the Indian government selling an average of 1,500 head annually. War horses ready for delivery. Since Guyton and Harrington was in good standing with the British government after the Boer War, they received a cablegram from London not long after World War I began asking them to meet with a group from the British military. Contracts were soon drawn up and General Benton was in charge of all purchases through Guyton and Harrington's Missouri operation. 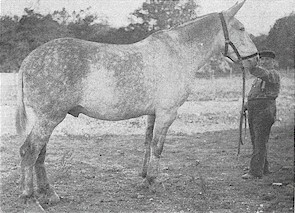 As a major supplier to the British government, it was estimated that about half of the total number of horses and mules purchased in this country would be supplied by Guyton and Harrington. Guyton and Harrington was composed of 15,000 acres with four railroads nearby. At one time there were 53,000 head of horses and mules located at Lathrop. Due to the sudden demand for horses and mules, it was important that a great amount of construction was completed rapidly. More than 300 carpenters were employed and a large lumberyard was established due to the rapid growth of the firm. Twelve men were also kept busy purchasing hay around the country by the trainload. A crew of farriers were also employed to trim hooves and shoe the animals. Each animal was identified by a tag and was checked in and out upon arrival and departure. A British officer was on hand at all times and aided with the organization of the employees. Due to enemy activity several shiploads of mules sunk off the British and French coasts, but replacements were sent according to the needs. The British bought both geldings and mares unlike the American Army which only purchased geldings. Many animals were shipped daily and amazingly, Guyton and Harrington were always able to fill the orders, no matter how large. 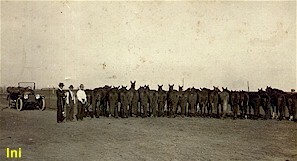 It was estimated that Guyton and Harrington supplied about 350,000 horses and mules during World War I making Lathrop, Missouri the Mule Capital of the World at that time. Williams, Walter. 1904. The State of Missouri. Press of E. W. Stephens, Columbia, MO. This page was designed by Lisa Blankenship.